What better way to celebrate the NHS hitting the big seven-zero than with a relevant hashtag #NHS70 and a bit of social network analysis(SNA)? For the uninitiated SNA is the process of looking at social structures through the use of graphs. When applied to social media, it’s quite useful for showing those who are central, or ‘popular’, to a given community. When displayed each Twitter account is represented as a node (circle things to you), and each connection (tweet, retweet ect.) between the accounts is represented as a line. 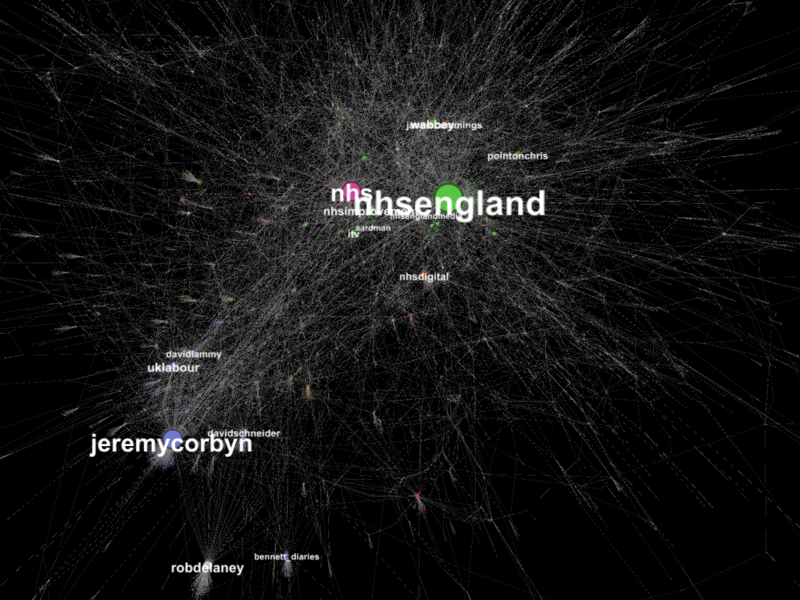 So for the NHS’s 70th Birthday, I took 26,482 tweets that contained the hashtag #NHS70, then loaded the Tweets into a program called Gephi. I then set some perimeters the graph to make the most prominent accounts (nodes) bigger, and coloured them by their online social community. I was also able to extract a list of the most central accounts. Below is the result! So, what does the graph tell us? Well, for starters there’s some political currency being made today in Labours favour. When we look at the list of most ‘important’ Twitter accounts in the graph, the Conservatives don’t come off well. Jeremy Hunt is 35th most important in this graph and the Conservative party account is 31st on the list. Poor Theresa May’s Twitter account is all the way down at 119th. Suggesting the age old perception that the Conservatives are not well associated or trusted on the NHS holds true on Twitter. The opposite is true for Labour. With Labour Leader being 2nd most popular, the Labour party account being in 5th place, and Labour’s David Lammy at 12th. Ultimately, the graph somewhat represents the trend that Labour are “by far the most trusted party on the NHS”. The most important accounts, outside of politics, are those directly connected to the NHS such as NHS accounts, or by people who have promoted or supporting the NHS. Accounts such as @PointonChris are owned by people who have written or spoke largely on the NHS. An odd one is Westminster Abby (@Wabbey) whose high position is due to a service being held there to celebrate #NHS70. There are also a number of media titles (ITV, BBC, Guardian) that will often pop up on SNA graphs, and their occurrence is quite regular for these types of current affairs hashtags. So there we go. This analysis has a slight limitation that I can’t collect every tweet using #nhs70. 26k tweets is a small sample compared to the million+ tweets on the subject. However, on the grand scheme of things it’s a good representation of who is the most central characters in the conversation over the NHS’s 70th Birthday!